The Aluvihara near Matale in central Sri Lanka is a typical cave temple with painted shrine rooms in the Kandyan style. However, the location has been used as a monaster for a much longer period. It claims to be from the earliest period of Buddhism on the island. According to Theravada beliefs, Aluvihara is of utmost significance for the history of Buddhism, as it was here where the canon of Buddhist Holy Scriptures, the Tipitaka, was written down completely by a group of 500 scholarly monks. As a matter of fact, the entire canon, though known from Tibetan and Chinese translations, too, is only partly handed down in India, where it is called Tripitaka in Sanskrit. The only complete Buddhist canon in an Indian language, Pali, is known from Sri Lanka. The process of textualisation took place in the 1st century B.C. The Aluvihara is believed to be the monastery where this important event in the history of Asia took place, which is counted as the 4th general council in the Theravada tradition of Sri Lanka and Southeast Asia. Buddhaghosa, the master scholar of Theravada Buddhism, who lived in the 5th century A.D., is said to have resided in the Aluvihara, too. Today’s travellers can visit a museum of palm-leaf writings, painted caves and climb a rock offering lovely vistas. The monastery of Aluvihara lies at the foot of green hills, 3.5 km north of the railway station of Matale. It‘s situated right next to the main Jaffna-Mihintale-Dambulla-Kandy road (A9), which is the major tourist route from all major places in the Cultural Triangle to Kandy and the hillcountry. Many travellers take a break close to the Aluvihara to visit one of the herbal and spice Gardens offering guided Ayurvedic information tracks. Although situated right in the middle of the well-trodden path, the Aluvihara is not included in all tourist itineraries, although it‘s a heritage site of historical significance. The Aluvihara temple is located 43 km the south of Dambulla and 30 km north of Kandy, driving distance to each of the two World Heritage Sites is one hour one way, as Kandy and Matale are usually too crowded to drive faster. The monastery belongs to the small town of Aluvihare, which is actually a suburb of the district capital Matale. Besides „Aluvihara“ and „Aluvihare“, „Alu Viharaya“ or „Aloo Wihara“ are spellings found in books and online. The prefix „alu-“ is derived from „aloka“ with a long „a“ at the beginning, it means „shining“ or „light“, it‘s a common ancient Indian term for „glance“ and also for „insight“. But „aloka“ with a short „a“ means „otherworld“ or even „doomsday“. There are also different version, how the Aluvuhara received its name. One legend refers to the translation of “Alu Lena” as “Luminous Cave”. During the reign of King Devanampiyatissa, the first Buddhist king of Sri Lanka, a monk was working on Tipitaka commentaries. Sakra, the king of the gods and guardian of the Buddhist faith on Sri Lanka, saw this and supported his efforts by illuminating the cave. This is a delightful story, however, it seems not only miraculous but also surprising, that a monk was writing a commentary to the Tipitaka even before the Tipitaka was written down, which was done two centuries after Devanampiyatissa. Another explanation of the toponym goes: The rock temple faces east and thereby receives the morning rays of sunrise. Aluvihare is also the name of the town and of its most famous family, which has looked after the temple for a long time and is one of the traditional upper-class clans in Sri Lanka and recent decades also played an important role in politics. But it’s more likely that the family is named after the sacred site than the other way around. They were once owners of the largest property in this area and still have a house in Aluvihare. Brahmi inscriptions give evidence of the early origins of the Aluvihara monastery near Matale in the 3rd century BC. No less than the first Buddhist king of Sri Lanka, Devanampiya Tissa, is believed to have founded the Aluvihara monastery and to have built a dagoba and planted a sapling of the Bo-tree here. 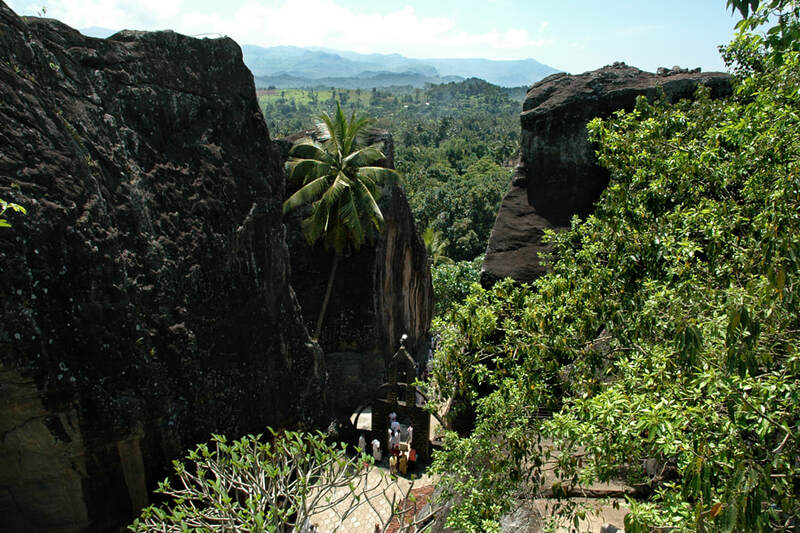 It’s highly likely that the caves provided shelter to hermits during that early age of Sri Lankan Buddhism. The Aluvihara is highly venerated by Theravada Buddhists from Sri Lanka and Southeast Asia alike, since it is regarded as the site where the Fourth Buddhist Council took place, which for the first time layed down the entire Buddhist canon of Holy Scriptures in written form. The Pali name of the Scriptures is Tipitaka. As a matter of fact, in the 19th century the British were surprised to find a complete text version of the Tipitaka as palm leaf manuscript in this monastery. But the historically important library of the Aluvihara was largely destroyed by British troops when they attacked the temple in 1848 to put down the Matale rebellion. The oldest surviving ola leaf manuscript of the Tipitaka then got lost, but the text, of course, can still be found in several other copies. Previously, it had only been known from Chinese and Tibetan translations that such a text corpus had existed in early Buddhism. But only very few text passages written in Sanskrit have survived in India. The Pali text known from Sri Lanka is the only complete canon in an Indian language and the only complete version that came down from pre-Christian centuries. Pali is the sacred language of Southeastasian Buddhism, too. The Aluvihara is held in high esteem by Buddhists from around the world and a usually an item on the itinerary of Thai people visiting Sri Lanka. The rock temple was declared a national monument in 1971. The history of the textualisation of the Tipitaka, which until then had been handed down orally, goes back to the reign of Vatthagamani Abhaya, who is known as King Valagamba or Walagambha among Sinhalese. In the year 103 BC he was expelled from Anuradhapura due an invasion of Tamil warriors from India. Before or during his years in exile in the hillcountry, the country suffered from a terrible famine additionally. It is said that people were in such despair that cannibalism occured. Many monks starved and most of the monks had to flee from Anuradhapura. Due to the famine they could not receive sufficient alms any more. They are said to have eaten yams, roots and leaves for their survival. Some went to India, agroup of about 60 of them went to the hillcountry, known as Malaya Rata, and lived on the banks of Mahaweli river. Despite the harsh conditions, they survived for 12 years till the famine known as „Bamini Thiya Saya“ came to an end. Monks who had left to India too returned to Anuradhapura. But due to the famine they were now fully aware the mere survival of Buddhist traditon in the island was threatened with extinction. When Vatthagamani Abhaya succeeded to recapture the capital in the year 89 BC, it turned out that prior to the return of the monks from exile there were not enough monks left in Anuradhapura to transmit the Buddhist scriptures to future generations. Particularly speaches of the Buddha (Sutta Pitaka) and the canonical monastic rule (Vinaya Pitaka) could get lost. Facing the catastrophe of the famine and due to the continuing threat of Tamil invasions, the king too became aware, that with the decimation of monks the knowledge of the words of the Buddha could also disappear. That‘s why Vatthagamani decided to convene all available Buddhist monks from far and wide to the Fourth Buddhist Council. 500 monks arriving from various regions and countries joined the Buddhist Council. By the way, that‘s just the same number of monks who gathered at the First Council immediately after the passing away of the Buddha, when the canonical text was collected for the first time, then orally by reciting it. In general, a Buddhist Council does not debate issues of doctrine like a Christian Council, but its task is to preserve or restore the canonical corpus of texts. In the year 1871, the fifth Theravada Buddhist council, which took place in Mandalay, Myanmar, engraved the corrected version of the Tipitaka in stone. In order to preserve the Buddhist Dharma for posterity, the Fourth Council taking place in Sri Lanka in the 1st century BC decided to lay the corpus down in written form for the first time. It is said that within three years, three months and three weeks the Tipitaka came to existence. The Pali Term, known as Tripitaka in Sanskrit, translates to „three baskets“, referring to the topically arranged three collections of manuscripts, Vinaya Pitaka, Sutta Pitaka, and Abhhidharma Pitaka, the latter being the doctrine of Theravada Buddhism layed down systematically. Though the Abhidharma in particular can differ from sect to sect in modern-day Buddhism, the Tipitaka is part of almost all canons of Buddhism, also in Mahayana traditions. Most likely, the historical background of this Fourth Council is a famine indeed. The calamity may have brought to mind: Even if not all monks died, parts of the Tipitaka could get lost, because the monks were not able to memorize the entire corpus. Rather, different parts of the text were handed down in fragmented lines of monks specialized on memorizing them and complementing each other. Famines meant the risk of discontinuation of some of these oral succession lines, resulting in a loss of fragments and hence of the integrity and completeness of the canon. In the Mahavamsa, Sri Lanka‘s ancient „Great Chronicle“, the famine is not mentioned as the root cause of the textualisation. But apart from the chronicles, the commentaries to the Tipitaka, written down in roughly the same time as the Mahavamsa, give further historical information. The name of the Aluvihara as location of the textualisation is neither given in the Mahavamsa nor in the Tipitaka commentaries. It‘s a local tradition. Later Theravada generations of the „southern Buddhism“ counted this textualisation process as the Fourth Council, whereas northern Indian traditions credit King Kanishka from the Kushana dynasty with convoking a Fourth Council, which was held in Kashmir (according to other oppinions in the Punjab). The Fourth Council held in the Kushana Empire is often regarded as the establishment of the Mahayana tradition spreading from the Kushana Empire to East Asia. The Aluvihara is said to have been the place of safekeeping the sacred texts during various invasions that threatened the survival of the Buddhist tradition, for example when Kalinga Magha from India captured the throne and marauded the Polonnaruwa Kingdom in the 13th century. The Sinhalese king Rajasinghe in the late 16th century also persecuted Buddhist monks, after he became a fanatic Hindu full of hate of Buddhist priests who had criticised him. During his reign too monks took shelter in the caves of the Aluvihara to keep the Tipitaka safe. There are numerous caves with ancient inscriptions in Aluvihara, the earliest are said to date from the 2nd century BC, using the oldest alphabeth known from Sri Lanka, the Brahmi Lipi characters. The Aluvihara Brahmi inscriptions deciphered and listed as numbers 820 to 822 by Senarat Paranavitana, then Sri Lanka‘s most renowned epigraphist, mention names of chief monks and lay devotess. Both is not typical for rock inscriptions from the pre-Christian centuries. Usually, the earliest inscription only mention the name of a king as a donor and the name of the entire Buddhist order as the recipient, the Sangha of the four directions. However, some more inscriptions mentioning this „Order of the four Quarters“ have been discovered at the Aluvihara caves after those piblications of Professor Paranavitana, who was Ceylons‘s first Archaeological Commissioner after independence.